Your department staff says it's OK to get rid of arsenic into a surface water source. However, this only leads to more questions that need answers. After waiting over 7 months,Director Don Labossierie's August 7 reply is not very encouraging about how the province deals with the disposal of captured arsenic,especially when we have been told to 'never put' arsenic into a water source. At a public meeting held in Virden in May of 2012, Dr. Susan Roberecki, of Manitoba Health told us, "Arsenic is not something that is put in water. It should never be put in water". Yet, the province of Manitoba has issued a permit to the Town of Virden to do exactly that ! Virden removes arsenic from it's well water source through its water treatment system in an attempt to meet safe drinking water standards, captures it and then has permission to release it into a freshwater creek. Labossier's justification for this practice includes information contained on an internet link. But I can find no reference there that supports this. After 17 years of trying to get government authorities to address Virdens's arsenic disposal practices, it appears that this is acceptable departmental policy. Is this indeed the policy of the Manitoba government? Is this the best solution your water experts can offer for keeping our water sources safe and protecting people's health? Is not the discharge of a poison, a pollutant, that contaminates a surface water source illegal under the Environment Act and normally, be an issue of grave concern, a violation and despicable practise? 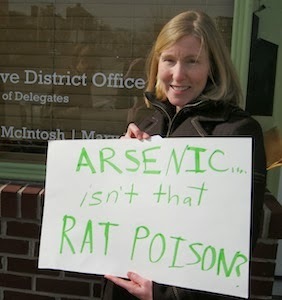 Does Labossiere know where this poison arsenic, eventually ends up?Have the "disposal" waters and lands been tested? I have been informed there are no compliance issues. Makes one wonder, doesn't it? increased treatment cost to the water user or supplier"
Please provide me with a study that proves that Virden's arsenic disposal protocol does not create an unacceptable increased risk to public health with its release into the environment. If a study actually exists, were there any health specialists involved in doing that study? costly for the Town to properly store and safely dispose of the removed arsenic by putting it back into the environment,via Gopher Creek? Do you agree with your staff that the solution for pollution is dilution? in disposing of arsenic in the manner in which government has permitted? It seems government doesn't care. The 'out of sight, out of mind' syndrome is at work. government to protect our health, water and environment. When dealing with arsenic, complacency must never be tolerated, and respect for human and environmental health must be foremost at all times. I urge you to commit this permit to the waste basket and direct the Town of Virden to use a hazardous waste disposal site for its captured arsenic. WHAT ARE WE PUTTING INTO OUR WATER ! We are putting toxic waste into our water. contaminants to a water source. This is a shameful and disgusting Act.